The Air Quality Monitoring Section collects measurements of ambient level pollutants throughout a statewide monitoring network to ensure that State and Federal air quality standards are met. 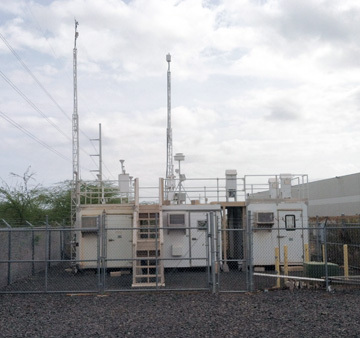 We operate, collect and report ambient air data from air monitoring stations located on Oahu, Maui, Hawaii, and Kauai. We maintain a web site that displays near real-time air quality data from specific stations statewide. The data on the Daily Air Quality Data website are preliminary and await review and validation by qualified staff. The data may be revised or invalidated after review. The Department makes every effort to assert the validity and integrity of the data, but data can be affected by equipment malfunctions, technical difficulties, and other unforeseen circumstances. What’s new at the Air Section? Established volcanic haze air monitoring services at Pahala, Mountain View, Hawaiian Ocean View Estates and Waikoloa. Established a National multi-pollutant station at Kapolei, Oahu. Established an air monitoring station at Niumalu, Kauai to monitor ambient cruise ship emissions. Upgraded our air monitoring data acquisition system. Participated in performance audits conducted by the Environmental Protection Agency and Clean Air Branch for all pollutants. Attended factory certified training for continuous gaseous and particulate monitors. Transmitting data to Hawaii Short Term SO2 Advisory website.